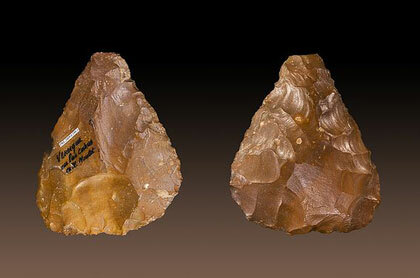 Australopithecus made stone tools at least 2.6 million years ago in Ethiopia (source). Modern and ancient chimps have been known to make and use stone tools for multiple purposes too (source), so the use of tools may date from well before the split between the two species some 6 million years ago. The first evidence of control of fire by early hominids goes back to about 1.5 to 2 million years ago, in East Africa, China and possibly other regions too (source). Homo erectus started making stone-tipped spears at least 500,000 years ago in South Africa (source) and 400,000 to 500,000 years ago in northern Europe (source). Archaic humans cooked food in a hearth at least 300,000 years ago in Israel (source). The earliest evidence of religion come in the form of totemism or animal worship (like bear cult) practised by Neanderthals, some time between 100,000 and 300,000 years ago. Neanderthals started burying their dead possibly as early as 300,000 years ago in southern Europe, and indisputably since 130,000 years ago (source). The first signs of jewellery appear circa 100,000-years ago in the form of shell beads recovered in Israel and Algeria (source). More elaborate jewellery dating from 75,000 years ago has also been found at the Blombos Cave in South Africa (source). Neanderthals made string/rope at least 90,000 years ago in France (source). Homo sapiens made paint from red ochre at least 75,000 years ago in South Africa (source). Homo sapiens may have made bow and arrows as early as 64,000 years ago in South Africa (source). Humans started making fish hooks at least 42,000 years ago in Indonesia (source). 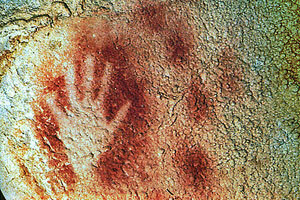 Humans made the first cave paintings at least 40,000 years ago in Spain (source). The oldest known musical instrument is a flute from Germany dating from 35,000 years ago (source). Humans first domesticated dogs around 32,000 years ago in Belgium (source) and in the Altai mountains (source). 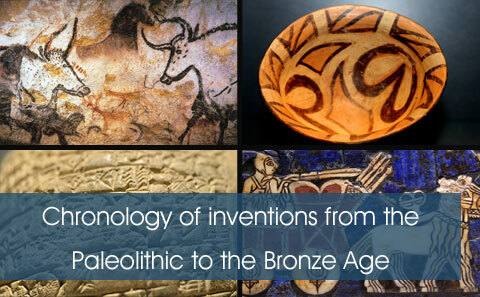 Humans started to make ceramic at least 25,000 to 29,000 years ago in Central Europe (source). The first pottery vessels appear at least 20,000 years ago in Northeast Asia (source). The cultivation of cereals appear to have started at least 12,000 years ago in the Levant (source), and perhaps earlier in Northeast Africa. Humans started building stone structures, including temples, at Göbekli Tepe in Anatolia about 11,000 years ago (source). The use of calendars dates from at least from 10,000 years ago in Scotland (source). The world's first bricks were made in the Near East at least 9,500 years ago (source). Metallurgy may have started in the Balkans with copper working (c. 7,500 years ago, source), followed by gold (7,000 ybp), bronze (6,500 ybp) and silver (6,000 ybp). The oldest evidence of writing date from 7300 years ago in central Romania (source) and northern Greece (source). The world's first cities appeared in southern Mesopotamia some 6,500 years ago (source). The first potter's wheel appears in the Near East between 6,500 and 5,200 years ago, during the Ubaid period (source). The earliest evidence of horse domestication, and perhaps also horse riding, dates from 6,000 to 5,500 years ago in the Eurasian Steppe (source). The oldest trace of glassmaking comes from the Near East circa 5,500 years ago (source). Shoes only show up in the archeological record from 5,500 years ago in Armenia (source). Ötzi the Iceman, the oldest natural human mummy, who died in the Alps 5300 years ago also wore leather shoes. Humans started making swords and bronze weapons in the Maykop culture in the northwest Caucasus c. 5,500 to 5,000 years ago. The world's oldest known wheel is approximately 5,200 years old and was found in Slovenia (source). The oldest known horse-drawn chariots date from the Sintashta and Petrovka cultures in the Eurasian Steppe, c. 4,000 years ago (source).